Pat Lambie during his time with Racing 92. RACING 92 HAVE CONFIRMED that Patrick Lambie has been forced to retire from rugby at the age of 28 due to a succession of head injuries. The South Africa fly-half earned 56 caps for his country, the last of those coming in 2016, and featured in two World Cups. Lambie suffered the first of his head injuries in June 2016 when he was knocked out by Ireland’s CJ Stander, before sustaining a concussion while playing for the Sharks 11 months later. 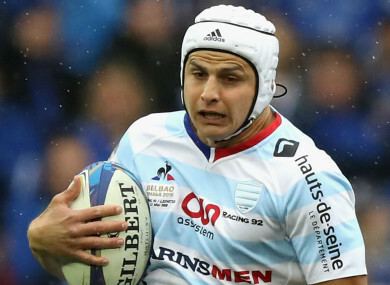 In January last year Racing confirmed that Lambie’s eye socket injury against Oyonnax was not another concussion but on Saturday the Top 14 side released a statement to announce the fly-half had taken the decision to hang up his boots. “We understand his decision, made by mutual agreement, but we regret that such a genius of the game is forced to come to this end,” said Racing president Jacky Lorenzetti. Patrick is a huge champion….as elegant on the field as outside. At the club, we all had a sincere and friendly relationship with him, astonished by his desire to integrate. “His French teacher could testify, as well as his coaches, to his involvement and his seriousness on a daily basis. “But the will is unfortunately not everything. Patrick suffered several injuries. Racing and in particular its medical service have done everything to ensure that he is welcomed in the best conditions and that he can express his immense versatile three-quarter qualities. He has repeatedly proved that he was one of those rare players who know how to spark. It’s no coincidence that he led the Springbok attack 56 times. Email “Former Springbok Lambie retires from rugby after succession of head injuries”. Feedback on “Former Springbok Lambie retires from rugby after succession of head injuries”.